Meet The emerging new leader in the Basketball court who knows how to slam dunk! Sanjana Ramesh – The emerging new leader in the Basketball court who knows how to slam dunk! Sanjana Ramesh is a rising teen star in basketball, a reigning champ who swiftly maneuvers her way around a game. Effortless and gracious, she reaped the fruits of her career at a very early age. Sometimes, talent has a way to shine through and make itself visible to the observant. In such cases, even luck favors you. For Sanjana, becoming the captain of the Karnataka basketball team at the Youth National Basketball Championships opened new doors and opportunities. It is the dream of every player to lead their team to glory. When Sanjana got bestowed with the responsibility of captaincy, she was surprised. She had not expected the role but now felt it was time to get serious. After all, with great power comes great responsibility. Although Sanjana has a major responsibility to undertake, she feels she is not alone in doing so. Her dream is shared by each of her teammates and together they vow to put their name down in the history of the sport. Sanjana came to notice in the Junior Nationals where the Karnataka team, captained by her, won their first gold in 35 years. The role of being the captain does not come as an added pressure to Sanjana. For her, it’s all about teamwork and being comfortable around each other. She was leading a team who helped each other grow, shaping each other’s’ flaws into perfection. Another player who caught the attention of many was Grishma Niranjan. She gave an impressive performance in her debut at the Youth Nationals. Sanjana, a center, is a student at DPS (South) and plays for Beagles BC and Grishma, a point guard, studies at Cluny Convent and plays for Rajmahal BC. Both the girls owe much of their victory to their coach Zoran Visic. They only have good things to say about him. Within two months of time, the man was able to coach an entire team starting from scratch. He pushed them to train harder and eventually get better. His approach was different which is what truly appealed to his personality. For Sanjana, basketball was initially a sort of leisure activity she enjoyed. But as time went by, she developed deeper roots and meaning with the game and before she knew it, she was captain! She received a lot of encouragement and support from both friends and family. Although, there was a slight doubt in the initial stages of her playing, it was all wiped out when with time, Sanjana got the opportunity to showcase her true capabilities. This is the era of the woman. There is nothing a woman can’t achieve. She is the mightiest of them all. In the world of sports, this has especially shown through. Women have seen a constant and steady uprising in the field and it is all entirely their own doing. Sanjana feels women should stand for each other and support each other. We should celebrate each other and strive to protect our very image by breaking society built constraints in the most swashbuckling manner. 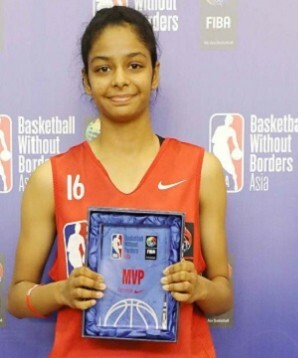 Sanjana Ramesh basketball captain U16 Basket ball Youth National Basketball Championships NBA Most Valuable Player Award.